I don't think Nomadic View Casting Studios could possibly have come up with any person as non-confrontational and harmless-looking as Bill Nye, better known as "The Science Guy." 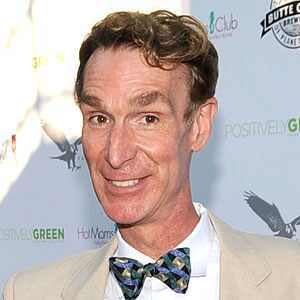 As a mild-mannered TV presenter for children's science shows, Nye is the last person I would think could rile the masses. He wears a bow tie, for pity's sake. Of course, everybody knows the Devil wears many masks. Apparently, back in 2006, The Science Guy upset a few good Christian people in Waco, Texas with his extraordinary "inflammatory" statements. Nye was in town to participate in McLennan Community College's Distinguished Lecture Series. The two lectures Nye gave were on such benign subjects as Mars exploration, energy consumption and global warming. According to a article from the Waco Tribune, sometime during one of the lectures, the audience became "visibly angered by what some perceived as irreverence." Everything had been going swimmingly until Nye brought up a bit of Scripture, Genesis 1:16, "God made two great lights -- the greater light to govern the day and the lesser light to govern the night. He also made the stars." Nye had the audacity to point out that moon is not a light but a reflector of sunlight. And that was the point where things went askew, Texas style. At this point, several people in the audience stormed out in fury. One woman yelled "We believe in God!" and left with three children, thus ensuring that people across America would read about the incident and conclude that Waco is as nutty as they'd always suspected. Since sometime in the 1980's, the soccer moms here all reach a certain age and then seem to all decide it's time to cut their hair super short and starting wearing mom jeans. They all drive SUVs with 10-plus stickers stuck on the rear window proclaiming every extracurricular activity that their kids are involved in. They get dressed up to go to the grocery store, because that's about the only thing outside of the house they'll ever get to do. Just yesterday I walked past one of these women in a store with so much perfume on my eyes started to water and I began to feel nauseated. Their goal in life is to have kids, as there is really not much else to do around once you reach a certain age if you are a woman. Thanks to the author for sharing this. It made me smile. It's surprising how much this sounds like Oklahoma – a place I endured for four long years and emerged from as a scathed survivor. I would have thought the name Bill Nye the SCIENCE Guy would have cleared the room before things even got started. I still miss his show. I guess in Waco they think every place where there are seats and a lot of people facing the same direction must be a church.